I have two Victoria plum trees plus two which have grown next to them. I am finding shoots coming up all over the garden. Not just one shoot but several from what appear to be knots on the roots. How can I stop these shoots from happening, please? 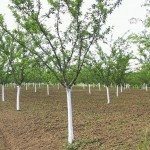 Here is an article about weed trees and some suggestions on controlling this issue.